Having a period is natural and should not be a source of awkwardness for anyone. “That time of the month” can be inconvenient and embarrassing for women and girls. It shouldn’t be. For too long, women and men have shied aware from talking about periods. 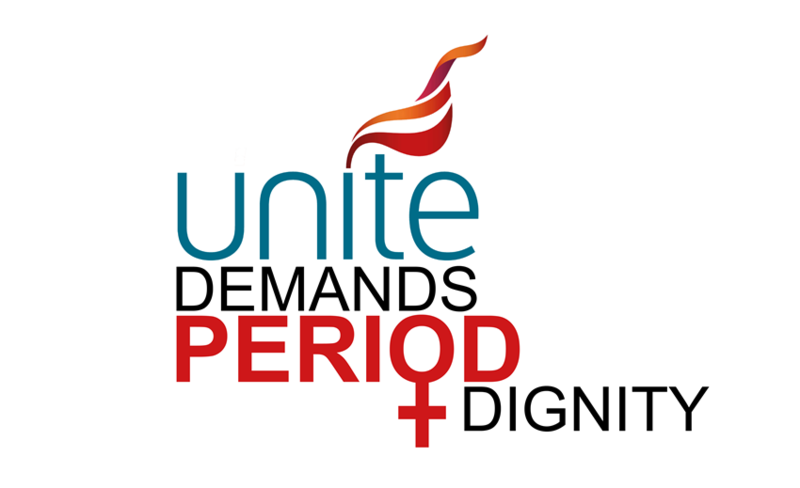 Unite is currently running a campaign demanding that women and girls have period dignity. By making changes in our workplaces, our places of education, and in society, women and girls will be able to have a positive period knowing that they are able to access sanitary products. Unite believes that, by changing perceptions, we can tackle some of the wider issues around periods – and the union is calling for access to sanitary products in the workplace and schools and to make that as normal as having access to things such as toilet roll. Support for period poverty campaign groups. Women and young girls should have access to these vital products. Nobody should face period poverty. And there are several things that you can do to help. And ask colleagues to sign the petition calling for the government to stand by their commitment to remove VAT. Contact local Councillors asking them to submit a motion to a Council meeting. A template letter can be found in the resources section on this page. If you don’t know who your Councillor is, you can find out here. Write to your local MP asking them to support the campaign to ensure that the Government remove VAT from sanitary products. Ask your friends and family to do the same. A template letter can be found in the resources section on this page. If you don’t know who your MP is, you can find out here. Print out a petition sheet calling for the government to stand by their commitment to remove VAT and ask your friends and family to sign it. Completed petitions should be returned to Demand Period Dignity, Unite the union, 2nd Floor, Riverside House, 7 Canal Wharf, Leeds, LS11 5AS. Resources are available from the Unite campaign webpage; there are posters, leaflets, petition sheets and template letters.